Here's why CBD oil is about to be the next big beauty trend. Don’t trip out, but CBD oil is about to be everywhere—from body creams to lip balms to edible oils for your salads. This is the plant genus that produces many cannabinoids such as hemp, marijuana, CBD, and THC. There are over 100 different cannabinoids so far identified in cannabis by scientists, but below are the most studied and understood thus far. Also known as cannabidiol, it’s the chemical compound that accounts for the soothing, floaty, good-vibes effects, but it is the counterpart to THC, meaning it’s completely non-psychoactive. It has a lot of health benefits when applied topically, or ingested (we’ll get into that below). Also known as tetrahydrocannabinol, is the chemical compound in cannabis responsible for a euphoric high. It creates the sensation most commonly associated with marijuana. It is the stem of cannabis plant, mostly used for strong natural fibers, and it’s legally sold in products nationwide. CBD that is derived from hemp is allowed to be distributed nationally. Alright, now that we’ve got that cleared up, let’s discover why CBD is really having a moment, and why you’re going to love it. If you’ve never tried CBD products, it’s hard to think of their need or purpose, beyond just the “getting high” novelty. But CBD isn’t here just for show, it produces some pretty impressive results. When applied topically, via a body cream, it can deliver incredible pain relief. So much so that it’s on par with mild painkillers (no really, it’s true). It’s perfect for relieving sore body aches in your hips, necks, etc. Lord Jones, known for their super luxe, weed edibles, have branched out into an all CBD Body Lotion ($50) (without any THC, so perfectly legal to ship anywhere). This version has an extra strength formula for sore muscles, joint pain, and skin conditions, and it’s formulated with frescolat, which creates a cooling sensation upon contact, for a soothing, rich lotion. Indie brand CBD For Life makes a Pure CBD Foot Cream ($20) which was made for pre- and post-high heel shoe wearing. The CBD not only moisturizes overworked feet, it also reduces pain and inflammation from tight shoes and excessive standing. It’s like meditation, but in a bottle and effective immediately. When ingested, CBD can sharpen focus, energize, and boost your body’s ability to handle the stressors of daily life. 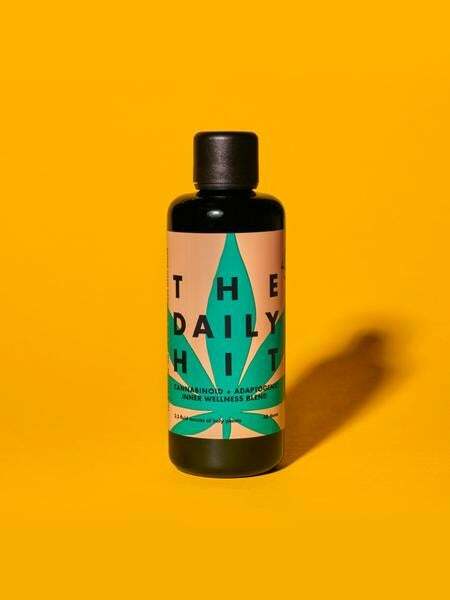 CAP Beauty, the leader in all thing wellness and natural beauty, has developed—in collaboration with Apothecanna (a Colorado-based company on the cutting edge of CBD research and formulation)—The Daily Hit ($96), a CBD oil blend made of mushrooms and adaptogens. CBD also works wonders on inflammation and a variety of skin conditions. “CBD is a powerful anti-inflammatory, while still being a natural ingredient,” says Michael Bumgarner, Cannuka CEO and founder. Cannuka’s CBD is pharmacy-grade and made from Colorado-grown hemp. The CBD Healing Skin Balm ($58) is known for its healing abilities toward blemishes and inflammation (redness), and can even soften skin on both the face and body. It even has such healing properties thanks to the addition of the superfood manuka honey, that it can calm more severe skin issues like eczema and acne scarring. CBD is also a commonly found product for lip balms too, for some dual benefits both topically and when ingested. We note ingestion for lip balms specifically because most lip balms we apply, we also consume, which is why you can get both levels of benefits from a balm. Vertly Hemp Infused Lip Balm ($22) is first off, organic, making it safe to inadvertently consume, but also made of hemp-derived CBD. It’s anti-inflammatory and anti-anxiety, but also just moisturizes wonderfully too, in peppermint and rose options.